The Advantages of Building a Custom Kiosk | Olea Kiosks Inc. Designing a kiosk from the ground up can result in a streamlined product without unwanted bells and whistles. When planning a kiosk deployment, there certainly are benefits to choosing one of a manufacturer’s stock models and adapting it to your needs. The unit likely has a track record of reliability and makes use of components that are readily available if an issue does happen to arise. In addition, the fact that the unit is manufactured in volume could mean a lower price relative to other models. Sometimes, though, it makes more sense to go with a custom-built model. By designing a kiosk to meet a specific use case, a deployer can ensure they’re not paying for unnecessary features and that the device will serve the exact purpose for which it was designed. The market for self-service technology continues to grow, with the latest report from Allied Market Research predicting a compound annual growth rate of nearly 14 percent over the next few years, reaching $31.8 billion by 2020. While that’s good news for kiosk manufacturers, it does present a conundrum for deployers. With self-service technology becoming an ever-increasing part of our lives, how does a brand create an experience that stands out from its competitors? In many cases, the answer is by designing a solution that’s an exact match to what that brand hopes to accomplish. 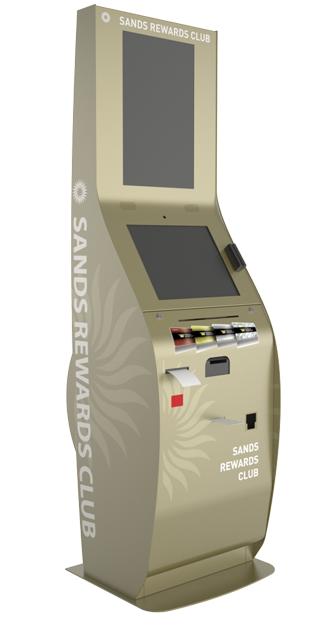 Olea Kiosks, for example, faced this issue when it was asked to design and manufacture a loyalty kiosk program for Las Vegas Sands’ Venetian properties in Las Vegas, Singapore and Macau, China. In Macau, for example, customers demanded the utmost in privacy while looking at their points on a computer screen in public. For those kiosks, Olea designers tilted the monitor inward and added privacy wings around the screen. In addition, they added 3M privacy filters on the monitors so they couldn’t be viewed from the side. Other property-specific features included a ticket printer that would allow patrons to print ferry tickets to get back to mainland China using points they had accumulated. In Singapore, the loyalty kiosks would be used mainly to play loyalty games where patrons could win prizes. Because these kiosks needed to attract attention, the main touchscreen monitor was flush-mounted and all privacy features were removed. In Las Vegas, the loyalty kiosks were much more complex than the other two locations. Those kiosks incorporated the ability to print new loyalty cards on demand, which required the installation of a full color Datacard printer with encoder as well as a Veridocs ID scanner to verify the person’s identity. The kiosk also needed the normal components such as barcode scanners, receipt printers, webcams, 19-inch widescreen touchscreens and 23-inch portrait-mounted advertising monitors. Because the Las Vegas kiosk was the most complicated, Olea began the design process by building that box, then scaling down the design for the other properties. For Olea Kiosks, the process of designing a custom kiosk solution typically begins with a meeting of all the players involved to lay out the requirements and goals of the project. From there, the design team will come up with sketches of the project, followed by computer renderings and a foam mockup. Following that, the renderings are converted to CAD files for manufacturing. A prototype is constructed for live testing, after which the project goes into full production. While there certainly are situations where a deployer can spend a lot on a custom project, that’s not always the case. In fact, deployers often choose a custom-built kiosk as a way to keep their costs low. Those clients often have a price target in mind, so Olea works with them in an effort to meet their needs at an acceptable price. “We’ve go industrial designers on staff, and we’ll also assign an engineer to work with them,” Olea said. So for those considering a kiosk project, the first step to a successful outcome is to sit down with an experience kiosk supplier, discuss your options and choose the best solution. Olea Kiosks stands ready to help.